WHAT IS A CONTINUOUS PASSIVE MOTION CPM MACHINE? 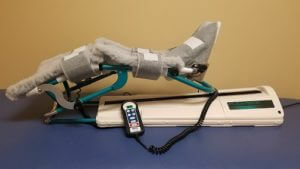 A knee CPM Machine is a device that helps a patient regain their range of motion after surgery (total knee replacement, ACL reconstruction). 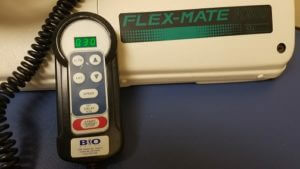 The continuous passive motion machine along with physical therapy is a great way to aid in your recovery after surgery. It is a passive machine, which means it does all the work. You can just relax and allow the machine to bend your knee. After surgery, you may feel stiff, but the CPM machine will help gain your movement back. Your physician or physician’s office will typically fax us the order (513-985-3865) and then we will contact you around a week prior to your surgery date. At that time we will set up a good date and time for one of our CPM specialists to come to your house. At your house, our specialist will make sure the machine is fit to your leg properly and you are comfortable in the using of the machine; he/she will instruct on proper care for the machine as well. The specialist will also review your physician’s protocol for the machine after surgery. Most insurances cover the cost of a CPM machine for up to 21 days post-operatively. Bioworks will handle any pre-certifications needed prior to your insurance company being billed for the services. If we know your insurance will not cover the cost of the CPM, we offer self-pay prices. Insurances typically do not cover a CPM if you are having a revision surgery or a manipulation. When our representative calls to set up the fitting, insurance coverage can be discussed..
A Bioworks representative will give you a call when your 21-day end date is approaching to schedule a pickup. Our driver will call you the evening before your pickup date, to work out a time that is best for you. If your physician has told you that you do not need the CPM machine anymore, and it is before the 21 days, that is okay; give us a call and we will schedule a time to pick it up. If you do call us prior to the 21 days, that is your end bill date, it may take our driver a couple days to contact you to schedule a pickup time. Our specialists can answer questions about getting a CPM. Just call us or complete our contact form and we'll get back with you within 24 hours.